Earlier this month, as a part of my work for the Capital Research Center and as executive producer of the film No Safe Spaces starring Dennis Prager, I traveled to hear Prager speak at the safe space capital of the world: The University of California, Berkeley. Yet I was surprised to see the school differed in many ways from the aggressively anti-free speech reputation it has developed. That reputation is not unfounded. UC Berkeley gained national attention for Antifa-driven chaos and physical violence in February 2017, when right-wing provocateur Milo Yiannopoulos faced overwhelming protests, signaling to those on the right that our physical safety could be endangered by traveling there. Since then, Ann Coulter was forced to cancel a planned speech on campus due to credible threats of violence, and $600,000 in security costs were required for Ben Shapiro to successfully speak this past September. But travelling to campus and speaking to students provided substantial nuance to what has been going on there. Second, while the left-wing students I spoke to admitted Berkeley is an overwhelmingly progressive campus and they are no fans of conservative speakers, they found the notion of participating in protests laughable. They claimed that the vast majority of students on campus are much too busy with work at one of the most rigorous universities in the nation to get involved with the school’s politics, let alone even be aware of every speaker coming to campus. Third, UC Berkeley’s new chancellor, Carol T. Christ, has called for a “free speech year” on campus, advocated for the libertarian free speech views of John Stuart Mill, and stated “I believe very strongly in Ben Shapiro’s right to speak on campus.” The school worked collaboratively with us to set up Dennis Prager’s event this week. Nonetheless, the most radical left-wing activists continue to give all liberals a bad name with their antics. 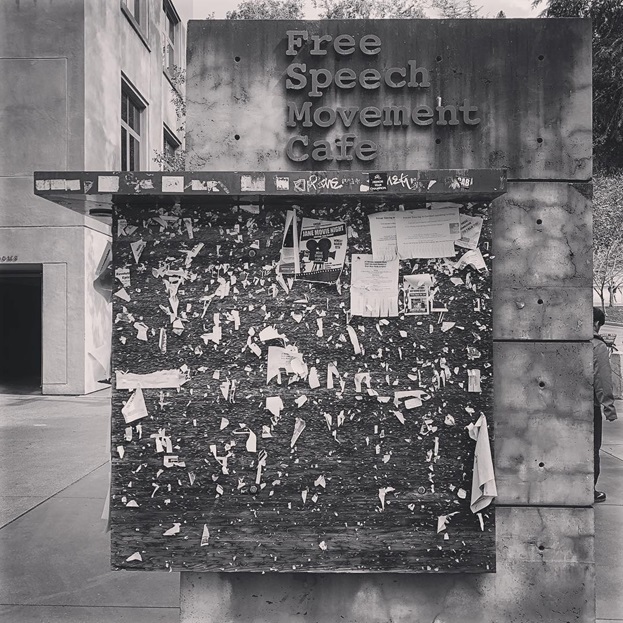 See the photo above, which I took outside the school’s “Free Speech Movement Café,” named in honor of the school’s 1964-65 student protest for free speech. Now, someone has torn down all of the flyers from this side of the bulletin board, depriving students of free speech at the space on campus most intended for it. The other side of the bulletin board is full of flyers, but they are almost entirely from hard-left socialist groups. Unfortunately, I suspect it’s those same groups who are responsible for tearing down whatever was once on this side of the bulletin board. Their ideology rests on reducing all of society’s ills into the result of power dynamics. Many of them consider free speech to be a tool of the powerful to keep them in power, so they support their own free speech (or that of marginalized groups) while opposing the speech of others. At UC Berkeley, we are left with an image of a school where most students support free speech or remain apathetic at worst. Yet a minority of students, mostly in the humanities and social sciences, partnering with radical locals, have had outsized influence, successfully shutting down right-of-center speakers and student speech. This unfortunate reality ought to inform our tactics. Rather than fighting a massive anti-free speech movement, we are actually fighting a powerful radical fringe — albeit one that has gained the sympathy of the uninformed. As conservatives and libertarians, we need to court those across the aisle who are under-informed about the radical threat to free speech. Although the anti-free speech movement is currently just a radical fringe, it won’t necessarily always stay that way. Many political views we currently regard as “mainstream” started on the fringe. That’s why this matter is so urgent. Dennis and the students didn’t agree on much (you can watch their conversation here), but they did agree on one thing: They all had the right to be on that stage. Jake Klein serves as media producer at the Capital Research Center. He is the executive producer of No Safe Spaces.